When my wife and I decided to have a child in 2011, we decided to foster parent as a response to a calling. There are more … ahem … “natural” ways to have children and we certainly considered that path. But we knew that we had the capacity and the life situation to consider adoption through the foster care system and that is what we did. We believed then as we do now, that fostering and adoption are faithful responses to the Christian calling to care for orphans. Our son moved into our house in June of 2011. He had already been in care for a year and it would take two more years to finalize the adoption. I won’t publicize his struggles over the internet, but it’s enough to say that he experienced normal reactions to an abnormal childhood. The transitions were very difficult for him and us, but he seems to have made it through those transitions quite well. We expect that he will continue to have some catching up to do after having a rough go during a key developmental time (0-3 years). We also expect that he is going to be just fine in the end. He smiles more every day. Each month he gets closer to the developmental milestones that are expected of children his age. He is making it just fine and so are we. Foster parents are not heroes. Foster parents haven’t given that poor kid a glorious life. The child may have clean clothes and their own bedroom in a safe neighborhood, but they have also lost significant relationship with the parents and siblings that they so dearly loved. A very wise social worker once told us that adoption and foster care is an attempt to find the least bad situation for each kiddo. And I’m convinced that foster parents are no more than that. Foster parents, at their best, provide the least bad environment for a hurting kid. The anti-abortion evangelical and Catholic rhetoric has been ratcheted up a significant notch in the past week with the controversial Hobby Lobby Supreme Court ruling. I happen to think that this was an important ruling for freedom of conscience of religious business persons. (This isn’t the post to argue about that, so please leave that particular subject out of the comments below.) But like a foster parent caring for a hurting kid, this “win” for religious liberty is not without consequences. The end result will be less access to birth control and likely a number of resulting unwanted pregnancies. Undoubtedly, at least some of those unwanted pregnancies will sadly end in abortion. But some of them will be born into difficult situations. Before proponents of religious liberty get too excited about last week’s Supreme Court ruling, they also need to consider that this liberty comes at the expense of some women being at-risk. That is cause for lament. Independent of the Hobby Lobby ruling, our country is already massively plagued with “orphaned” children. The US foster care system has had approximately 500,000 children in care at any time in recent years. About 140,000 children are adopted each year in the US, including about 55,000 of those from the foster care system. The balance are mostly private, domestic adoptions with just less than 10% being international. (For several great graphics of these stats, see the stats compiled by Wm. Robert Johnston.) Most of these kids are not “orphans” in the traditional sense. Their parents didn’t die in an accident or of illness. Their parents are unfit because they are on drugs and alcohol. They went to jail. They were too poor to provide a safe home. I think it is terrible that about 1,000,000 children were aborted last year. Christian people need to continue to work to reduce the number of abortions in our country in ways that respect the traumatic and difficult decisions that mothers of unwanted pregnancies must face. It is the call of God to protect and defend these vulnerable children and vulnerable mothers. Jesus’ call to serve the “least of these” demands nothing less. But a truly pro-life position does not end when a child exits the birth canal. In this sense, the Catholic Church has been much more consistent than have the evangelical churches, providing adoption services through Catholic Charities for many years. Thankfully, many evangelicals have also taken up the call to foster and adopt children in recent years through what has become known as the “orphan care movement.” These activists are urging Christians to respond to the ministry call of James’ epistle: “Religion that God our Father accepts as pure and faultless is this: to look after orphans and widows in their distress and to keep oneself from being polluted by the world.” Holiness and caring for the most vulnerable are central to faithfulness. Though I’m appalled by 1,000,000 aborted babies each year, the fact that there are 500,000 suffering children experiencing the pain of broken relationships and uncertain futures is even more atrocious to me. My sister and brother-in-law have fostered many children (none leading to adoption) and my wife and I have fostered just one and he became our legal son. The most striking thing about those relationships is the way that foster parents get pulled into the struggles and choices of the children’s biological parents. It is an incarnational movement to enter these broken lives and provide the limited support and care that you can for the children and their biological families. It seems to me that this is the “cross-bearing” that Christian faith demands when faced with a generation of orphans. Children do not need heroes. Speaking frankly, the slow and bumbling pace of the foster care system has no room for heroes. Rather, this ministry calls for a cross-bearing people with the radical pro-life message that these breathing children with broken histories matter to God, too. Maybe the most important action a pro-life Christian can take is to consider extending hospitality to a child in need of a home. It can take months to receive the proper approvals and training to become foster parents. And sometimes the children are only in your home for a brief time, disrupting most of your routines and tearing your heart out when they return to a home that you are uncertain is safe. If you are willing to bear that cross, you may have the opportunity to be the presence of Christ in a horrific time for a kid. It’s a great honor. The reality is that many people do not have the ability to open their home to hurting children. There are good reasons NOT to do so. A biological child that is particularly jealous or aggressive can be a good reason to not foster parent. A home that has already reached it’s “capacity” for children isn’t a great candidate either. Some flexibility in working arrangements will also be required, as there are lots of appointments and meetings that are required. The ability to be patient and present during the initial transition phase is an absolute must; it’s a massively time consuming process of creating a sense of safety and welcome (though maybe not any more so than bringing a biological child home for the first time). For those that cannot foster or adopt a child into their own home, there is an equally important pro-life action that is needed. As Russell Moore argues in his book, Adopted For Life, Christians need to create a culture whereby adoption is a critical aspect of Christian discipleship. The notion that Christians owe their relationship with God to a divine adoption as sons and daughters should reposition adoption as norm within the Christian community. In the church, adopted children should not be less than biological ones (or “real” children “of your own,” as they are sometimes offensively called). Our status as God’s children depends upon this divine act of giving life through adoption. I pray that churches will start ministries of respite care for foster parents. They can welcome providers of foster care training into their congregations to educate and recruit. They can host these trainings themselves. Mission budgets can allocate funds to ministries that support foster and adoptive parents and the biological parents of children at risk. If a church were to become active in this incarnational ministry, they may even find themselves entering into the lives of hurting people across their city and county. All of these smaller acts have the potential to create a culture whereby caring for orphans is as central to being Christian as James claims that it is. May we follow the Way of Jesus faithfully as the Church too begins to see adoption as central to the call to discipleship. 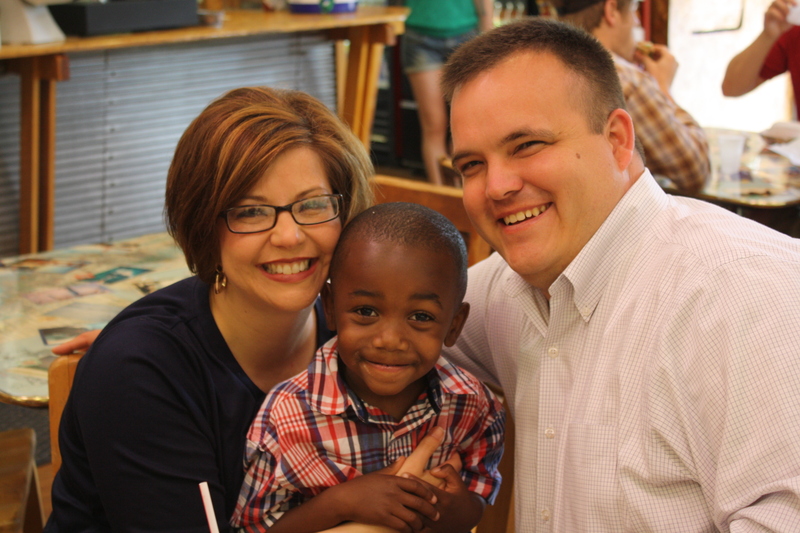 For more on the adoption of my son, see The Day That I Started To Understand Racism. This is beautiful. It pulls at my heart. I have wanted to adopt since I was 19 and haven’t because I’m still single. I’m wondering if it’s time to just figure out how to be a single parent or foster parent. Thanks for always speaking to the issues of the day. When I’m able, I’ll share this post. Thanks for your kind words, Emily. I certainly wouldn’t try to speak to your particular situation. But I will never again underestimate how difficult parenting is. I can only imagine how difficult it is for single parents. At the very least, I can say that single parents REALLY need the help of family to make it. There will simply be some times when parenting requires you to be in two places at the same time. Having a partner is important for making that happen. But I would also suggest that foster parenting may be a way to have a trial run at parenting. Many kids actually do go home. And you could even tell your case worker that you preferred to care for a kid that would likely go home for your first time. That would give you a chance to see just how flexible your life can be. Thank you for sharing this. It makes me glad to see others being intentional with caring for children as a crucial part of following Jesus. Have you heard of Safe Families for Children? It’s a great ministry, led by the Church, that comes along side families in crisis before abuse, neglect, or foster care are a part of the equation. Thanks Ryan. I hadn’t heard of this group before, but the concept is a good one. And that is a concrete way for churches to intervene in ways that the government simply cannot. Nice wrap Dr. J! Our family made the decision to both foster and adopt. Its hard, it can hurt and its a brilliant encapsulation of the love of my Jesus. Thanks for your willingness to love the least, the most! I enjoyed your post having accidentally stumbled upon it searching for good organizations to donate to (not sure how that happened!) I too have thought about fostering a child. My husband and I are Catholic and have always been open to children but have low fertility ourselves and figure that’s God’s way of telling us something! Best of luck with your beautiful boy, congratulations. I am pro-choice, and support a woman’s right to abortion and all people’s access to contraception. That said, this piece was very moving for me and I thank you for it. I rarely hear someone who is pro-life acknowledge that we have to protect children post-birth as well, and that children can be born into homes that unfortunately are not safe and healthy environments for them. As you mentioned, decisions like Hobby Lobby could lead to an increase in unwanted births due to less access to contraception, and the need to help at risk children should be an essential belief for everyone, regardless of whether they are pro-life or pro-choice. Thank you for your thoughtful article.